The Oriental doesn't put the same high price on life as does the Westerner. Life is cheap in the Orient. 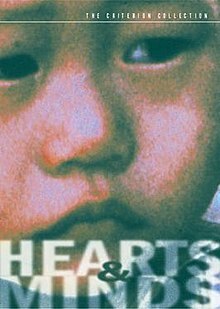 Hearts and Minds is an Academy Award winning documentary about the Vietnam War directed by Peter Davis. The film's title is based on a quote from President Lyndon B. Johnson: "the ultimate victory will depend on the hearts and minds of the people who actually live out there". The movie was chosen as Best Feature Documentary at the 47th Academy Awards presented in 1975. The film premiered at the 1974 Cannes Film Festival. Commercial distribution was delayed in the United States due to legal issues, including a temporary restraining order obtained by one of the interviewees, former National Security Advisor Walt Rostow who had claimed through his attorney that the film was "somewhat misleading" and "not representative" and that he had not been given the opportunity to approve the results of his interview. After Columbia Pictures refused to distribute the picture, Bert Schneider and Henry Jaglom purchased back the rights and released the film in March 1975 through Warner Bros.